In the Democratic Republic of Congo, coffee isn't just that drink that wakes you up in the morning—it's a way of life that goes back generations. "It's been here since our grandparents. It's a heritage," explains Dieudonne Nabuloho, who has been farming coffee in eastern DRC's South Kivu province since 1974. For much of that time, production and markets were booming. But in the 1990s, violent conflict crippled the industry, and farmers had few opportunities to export their coffee beans. That left many farmers at the mercy of the few buyers available. With little money coming in, their crops declined in quality, making them even tougher to sell. So the poor got poorer, with no source of income other than their coffee beans. Today, security is improving and the coffee sector is rebounding. And farmers are benefiting, thanks in part to an effort led by Catholic Relief Services called Kahawa Bora Ya Kivu, which means "Specialty Coffee of Kivu." Called KBYK, the project is helping farmers process and export their harvests while reducing hunger among farm families. It's a partnership of CRS, the U.S. Agency for International Development, the Howard G. Buffett Foundation, the Eastern Congo Initiative, Caritas Bukavu and other local organizations. KBYK takes a multipronged approach, including support for farmers to strengthen their local cooperatives, which helps improve their bargaining position with buyers. "Before the project, I was like a beggar, getting money in advance from buyers," Dieudonne says. "There was no relationship. No compromise." Strengthening the cooperative has increased trust and confidence as well. The cooperative provides farmers with information about the coffee market so they don't have to rely on prices set by buyers. "Now it's easier," says Dieudonne. "The main goal is to help poor coffee farmers," says John Munyemali, president of the cooperative. Making his way around the farm, Dieudonne brushes through some of his 900 coffee trees, bending and reaching to prune branches. He explains how the KBYK approach offers training and support from local Caritas staff. Apart from pruning, Dieudonne says, "Advisors have taught us how to support our plants and improve the soil." These techniques help improve the quality and quantity of coffee for farmers. With assistance from the KBYK project, several cooperatives in eastern Congo also operate machinery that removes the pulp covering the coffee beans, producing a higher-quality product known as wet processed, or washed, coffee. In the past, this was a laborious, time-consuming job done by hand, usually by women and children who stayed home from school. "Nobody can afford a machine to peel the bean," explains Dieudonne. "We are delighted the cooperative has a machine." By improving the quantity and quality of coffee beans, the cooperatives are helping farmers get a better price: "In the past, coffee was sold at 30 cents per kilo [2.2 pounds]. Today, we buy coffee for $1.70," Munyemali says. 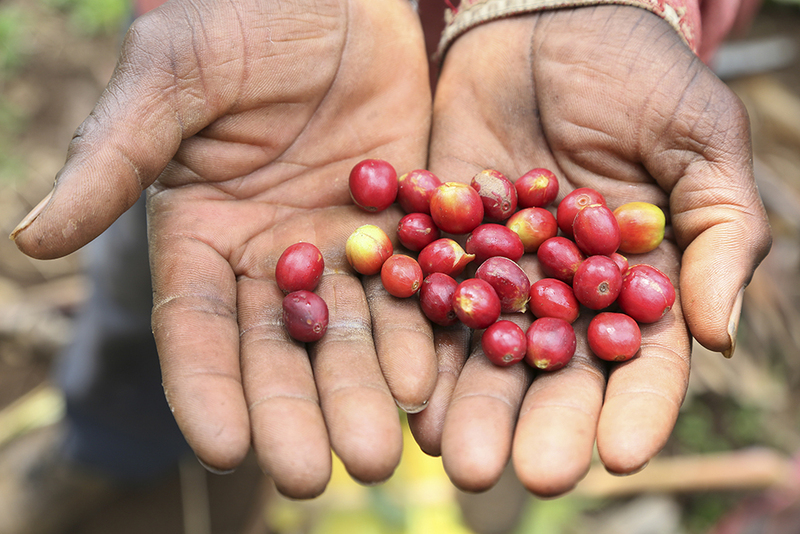 During a recent coffee quality competition in Eastern DRC, coffee produced by farmers supported by CRS' KBYK project was ranked as some of the best in Africa, using international standards. This has helped cooperative members sell it at a significantly better price and bring home more money for their families. "The project has brought so many changes," Dieudonne adds. "My family has been using the income to buy household needs. When I sell coffee, I can buy fabric, iron sheets and pay school fees."